Each day when I sit at the computer in my study I will at some time turn my head to look out of the window beside me. Now the weather in Northern Ireland is not that hot and sunny and when we do get good weather it is limited to a few days now and again during May - August. Although as I am writing this the sun is beaming down into my back garden which is the view I have from my study window. We are also known for our rain (although we do not get any more in the year than Delaware or Belgium - I know this because those are the other two places we have lived in and I did a bit of research - it just seems like it). So you may be surprised to find out what is sitting in our garden since May last year (not this year). Yes those are two white PVC sun-loungers sitting in my garden. And Yes they have sat there for over a year because we are rather lazy and didn't bother to put them away and also because we got a new BBQ last year (we used it twice) and some extra chairs to match our table so the BBQ and the chairs are now taking up the space in the garden shed where these two sun-loungers and their matching 6 recliner chairs used to be. We gave the chairs and cushions to our son and daughter in law so that they could have something in their garden shed. Now the point of this is that those two sun loungers always make me think of the chairs and the chairs always make me think of our Sun Room in the house we lived in, in Belgium for over 6 years. You see when we got to Belgium we had a Sun Room but no furniture to go in it so I thought well we will probably buy a sofa for it. But also when we got to Belgium we had garden furniture but no garden shed to keep it in and the garage was under the house so it was just not feasible to expect Fred to go down to the garage every time we would want to sit out in the back garden. So we just sort of started off by putting the garden chairs into the Sun Room. It was very convenient to just open the door from the Sun room to the garden and lift out whatever number of the chairs we needed. It was so convenient that they stayed there for the whole time we lived there and we never bothered to buy proper furniture for the Sun Room. So then you see we could say we just "made do" with what we had for the Sun Room. I spent many happy Monday mornings there sitting on those chairs as I prayed specifically for our kids. Many evenings were spent sitting on those chairs with family visiting from the UK. Many evenings were spent sitting on those chairs with other visitors from all over the world. Many very happy occasions were spent on those chairs as our church homegroup met in our home for pot luck dinners. Our homegroup was like our family away from our homeland. Most of the group were from other countries having come to Belgium through work etc. These were the people of all ages who met together on a weekly basis to worship and study God's Word together. These were the people who looked after each other in all sorts of ways when we had no other family to turn to. These were the people who shared each others joys and heartaches and prayed together through the deep desires of our hearts. No-one ever asked why we had garden furniture in that room. So you see I don't think of us just "making do" in all those years; I actually think of it as "making use of what we had" and it being a good job. We had people of every class of life in that room and every single one of them happy to sit on those chairs. That room was always full of smiling faces and I am thankful for the great memories that were created there. So the next time you think you are just going to have to make do with what you have either in belongings or in the talents and the gifts that God has given you (or as you may think the not so good as other people's talents and gifts) then think of my garden furniture in my Sun Room. Remember that you can make use of what you have and use it wisely for the benefit of yourself and of others. Be thankful for what you have and that you are not "just making do". Nice post! Thanks for sharing on the link-up. 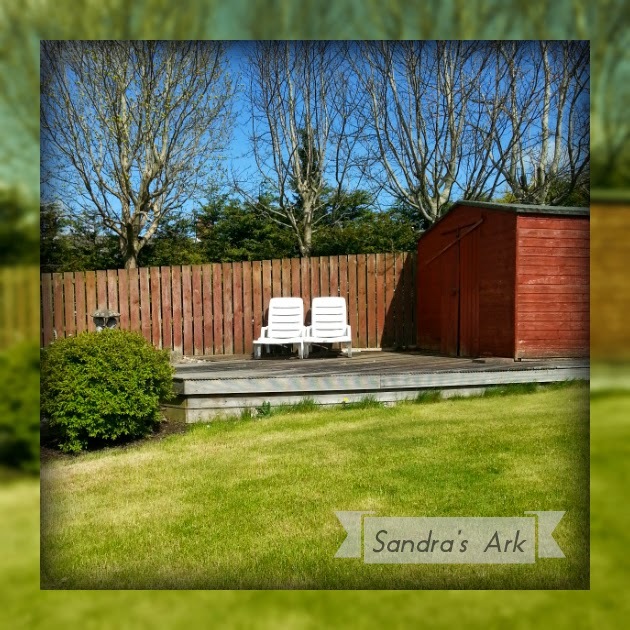 It is a lovely spot Joy, and I'm hoping that we do get some more nice days this year for me to enjoy it, but Northern Ireland is not known for great summers. Hi Sandra~what a blessed way to view the gifts God has given us and the creativity to use them in whatever way seems to fit. Beautiful memories have been created on those lawn chairs and that is a greater blessing than having "just the right furniture" for the room. Thank you for this encouraging reminder. Hi Janis, thank you for your encouraging words. Yes our blessings are great and of course not always material. Loved this! Perhaps in the "making do" we become "contented with" and that is when we "make the best use of". Wonderful reminder! Hi Joanne, yes I think it is good to be contented with many things. I'd call that being a good steward, Sandra! Thanks for sharing over at Testimony Tuesday! Well, reality strikes again. When we were in Uganda, we rarely had the "normal" furniture... I'm very happy that my husband could build whatever was needed for us or others ... and just to sit in or out, share the Lord, encourage the ones who walked through our area, that's some of the main God-job we had then. Here, in the mid U.S. area, we rarely live in that same way of life. BUT serving the Lord and sharing Him is still the best we can do. I like this story and how you shared... and WHAT you shared. Bless you. Caryjo, thank you so much you are always a great encourager, we seem to have shared similar incidents but yet is very dissimilar circumstances and learnt the same things. Blessings. I think it makes perfect sense to have garden furniture in a sunroom! Thank you Cynthia. Yes. Why not! Thanks Sandra for stopping by to share your story, I have enjoyed reading. We all do with what we have when we need, things dont always have to be prefect and makes us thanksful for what we do have. Hi Karren, making us thankful is indeed a good thing. What good advice, Sandra!! I am going to remember that as there are things in our current home that we are not prepared to buy at this point. What a good reminder to just simply be thankful for what God has provided. I will remember your chairs. I enjoyed this post. thanks Judith, I'm always amazed at the time you have to encourage others. Hi there, I'm your Three Word Wed. neighbor. How fun to discover your blog. We lived for four years in Okinawa with a quarter of our household goods. Lots of making do. So many great memories when we open our homes and lives to others, whether or not we need to "make do." Loved this post. My grandma would call that creatively using the blessings you have been given.... she would also say, waste not want not, and with that we can be an extension of grace. She would tell me she always only came to see me, not the house or what was in the house. Your words are a good reminder to be content and extend grace with what we have. Sandra, I too would treasure those chairs. Possibly I treasure my mom's three lawn chairs that she kept in her sun room. They were old timey painted white and either red or green (1 and 2) but have since rusted since being on my open back porch. More treasured is a pair of old, late 1970's, Hush Puppy shoes that I wore in the Holy Land. I could not begin to count the times they have carried me over Jesus path when he was Man, living in Israel. BTW, I came from Jenny's Alpabe link this week, for the letter "U". Did I get to the wrong post, the link was wrong, or did I miss the "U" part here? Thank you for peeking in on my latest 'Underwear' post. Help! This Blogging Thing is not Easy! The Smallest Room in the house?